The United States Supreme Court in a close 5-4 decision held that it is illegal for one lawful gun owner to purchase a gun from a federally licensed gun dealer for another lawful gun owner. The theory of the Court was that the true owner is not the purchaser, but the end recipient. And because Federal law requires the gun shop owner to accurately record the “owner” of the firearm, Abramski caused the gunshop to engage in a crime (i.e. falsely recording the name of the owner). 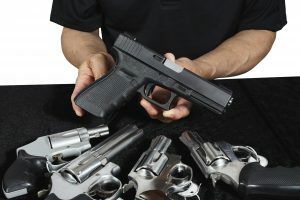 Although the current interpretation of law by the government is that it is legal for a person to purchase a gun and give it to a third person as a gift, or for a person to purchase a gun and raffle it off to a third person, or for a person to purchase a gun and then decide to sell it to another person, it is not legal to purchase a gun as a “straw purchaser.” A straw purchaser is one who enters a federally licensed gun dealer’s shop and purchases a firearm for a third person, who has either already given the straw purchaser money for the gun or who will do so immediately after the sale. The issue turns on intent. Apparently, according to Justice Scalia’s dissent in Abramski, the government’s position is that it is legal for a person to purchase a gun with the intent to immediately sell it to another individual, as long as the buyer and the end purchaser did not already enter into an agency relationship. Confused yet? Join the club. The Supreme Court has created a rule of law that lends itself to mass confusion and arbitrary enforcement by the Government. The Gun Control Act enacted by congress focuses on legislating federally licensed gun dealers, not purchasers or secondary market sales. Yet, the Abramski decision widens the net of 21 U.S.C. §922 to include criminalizing the conduct of otherwise lawful gun owners. You can read the entire Abramski Supreme Court decision here.